Over the years 3rd Chalkwell Bay have had a variety of bases before finally settling into our current home on Victoria Wharf in Old Leigh. This potted history of our headquarters has been taken from “The 3rd CB”, a history of the Group by Frank Bentley. 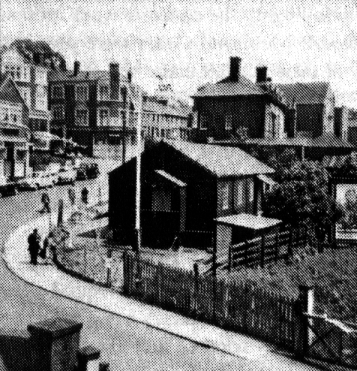 The original Den was the Old Town Railway Station (down-side platform). It had three rooms, a galley, a baggage store and long redundant men’s convenience, It also had, at the western end of the platform, a train signal gantry. At the other end a footbridge and a level crossing. Next to the level crossing was the signal box. 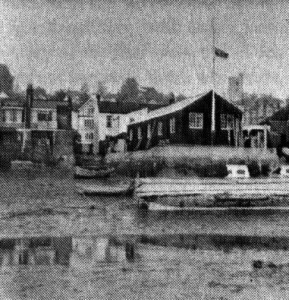 Only a part of the Station now exists, that being the ‘up’ side currently the Leigh Sailing Club HQ. The station was built in 1855. 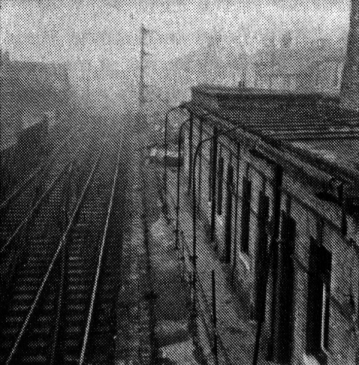 The old station became redundant around 1936, due to the fact that a new station had been built west of the cockle sheds at the bottom of Belton Way. At that time the Rover Crew were looking for a headquarters building, and the station looked tempting. The result was that one ‘Merri’ Merrifield who happened to be one of the more elderly eccentrics of the Crew decided to mount an assault on the land agents office of the then London, Midland and Scottish Railway Company. lie must have been a formidable sight to the agent as Merri had spent most of his life in distant parts of the globe and his personal appearance was something like a withered slightly jaundiced walnut… oh yes, I also recall that he had a loud commanding voice and thick lensed glasses which revealed his eyes as large round blue marbles. This worthy strode into the office and demanded to see the manager. The manager luckily for us turned out to be a Scouter. Says Merri (through the wrinkles) “You have a vacant station which I want to rent for the 3rd C.B… we will give you £5 per year for it, and I’ll stand you a lunch into the bargain”. The outcome was that the offer was agreed, whether or not the agent got his dinner must remain a mystery. The truth may be that the agent was only too pleased to get rid of our hero in double quick time. The 3rd were for the first time dabbling in real estate. The old station was to prove ideal for wet-bobbing, as 1 have already mentioned. After the war, British Rail took over in the fifties, and promptly raised the rent to £20 per annum. This nearly caused a mutiny, and we loudly made our feelings felt .. . all to no avail. Of course, we reluctantly paid up before our case was really investigated by the Railway bods. You see, they did not seem to know that for years, we had paid no Rates, had enjoyed free gas (light and fuel), free water, free gas mantles (which were ordered via the Signal men opposite) free timber when the level crossing was periodically replaced, and lastly – free coal which was politely requested from any steam engine that had the misfortune to stop at our signal. I know that you will agree that we were not robbed, but had in fact had the best deal ever offered in the history of the Line, as I have already mentioned earlier. Finally it came to pass that the old station was doomed and needed to be demolished to enable the widening of New Road to take place. in addition with electrification imminent, it would have been dangerous anyway to continue living on an increasingly busy railway. As you might have guessed, our situation was a tense one, and the Group Committee were hard pressed to find us a new home. Luckily a Cubmaster of the 1st C.B., Norma Bennett, mentioned to one of our Scouters – Dave Capstick – that she understood that some huts at the Salvation Army Colony at Hadleigh might be for sale. 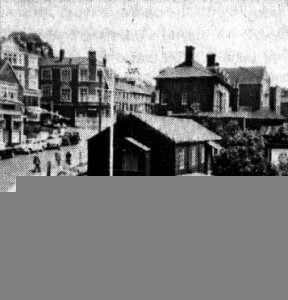 Firstly we managed to get the promise of a lease of a bit of land at the bottom of Leigh Hill, opposite the Ship Pub, from Southend Corporation. We offered £20, and after a bit of haggling, this offer was accepted. Secondly, we rushed off to see the Commandant at the Colony. Says he: “Yes we have several huts on an old Ack Ack gunsite, and you may have your pick provided the building is removed in two months from now. Oh yes, you will have to pay me £50 for it”. The hut picked was 72ft by 15ft in six demountable sections. We only needed five sections which allowed us plenty of spare parts. The following weeks saw a hive of activity on the site with demolition going on at Hadleigh, and some 60 concrete piers being built at the old town site. The weather was very hot, but helpful to the workers. The workers included Mums, Dads, Brothers and Sisters, and even relatives. All were led by our Clerk of Works, a certain Nick Harrison who was something of an eccentric fanatic (we do find them in times of need, don’t we?). He even had the mums straightening hundreds of three inch nails for re-use. The mums, bless them, supplied the picnic goodies. Back at Leigh our Chairman Maurice Baker was directing building operations. All was ready in time for the big move. It was a crash programme and a venture that set seal to our remaining in the Old Town. Why no mention of the Skipper you might enquire’? Well, his time was taken up trying to keep out of the way of the workers who would keep rushing about like demented ants. The hut was finished in quick time, and we were home and in the dry come winter. The Den was duly opened by Capt. McCraith, an Elder Brother of Trinity House. The Skipper’s wife was presented with the time-honoured bouquet. And the Skipper? He received from the Chairman a bag of crisps, which were eaten by a young son! After some two years of blissful existence in the new H.Q. the Southend Corporation and British Rail dreamed up the idea of a new footbridge over the Railway and our site! Of course, we had to go, but where? The Group Committee once again rose to the occasion, and before long had lobbied every Councillor and Council Officer concerned. There was little time for us to demolish the Den, yet alone move to another site. We were, however, lucky to have a champion in Councillor Mussett, Mayor at the time. The short story is that after much negotiation and heavy leaning on the Council we got the offer of the present site at Victoria Wharf still at £20 per annum, albeit for a ten-year period. The hard bit to swallow was the actual physical move, as we had only just recovered from the first one. Once again we built 64 piers on the wharf, this time to our own design using five gallon oil drums as concrete casings – hard work but cheaper. One of our committee had connections with British Rail Parcels, and borrowed a low-loader vehicle and driver to move the Den sections. This was the only way we could get the high load under the Old Town telephone wires (even these had to be stretched a little). Once again we held up the traffic and the Old Town inhabitants held their breath when the move got underway. The Police, yet again, looked the other way, and finally all was complete. We had in fact arrived at our permanent home, though at the time we did not realise it. This move was really the toughest, because the Hut which had been built in 1942, was much the worse for wear. Luckily for us, it was made in Canada from seasoned timber and built to last. We also had to buy a new felt roof. 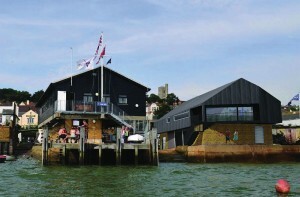 This necessity resulted in re-starting the Old Leigh Regatta to raise the money. It was a close run thing, but we got our roof. 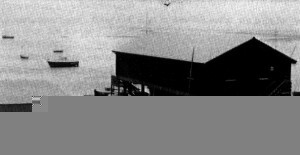 The new Den site was originally known as Saunt’s Wharf after the pre-war occupier Tommy Saunt. Indeed that worthy allowed us to use the wharf before the war for refitting our Gig ‘Dragon’, of which we have a photograph. 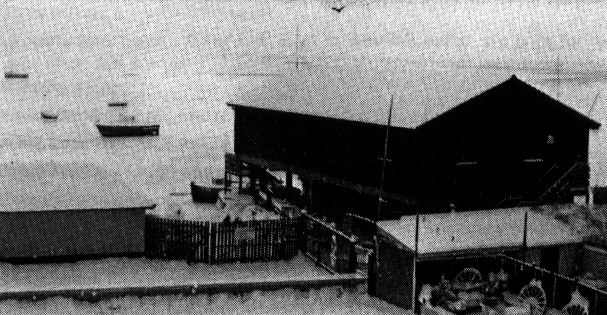 The Troop in the meantime held meetings in the Old Fisherman’s Chapel (now the Clarendon Venture Unit H.Q.). However, we were soon back in business in a unique position overlooking our moorings on the other side of the creek. This was a very different undertaking, in that the building was to be our permanent home – designed for our needs, and built professionally. Our previous Dens were maintained or built on the proverbial shoe-string budget. 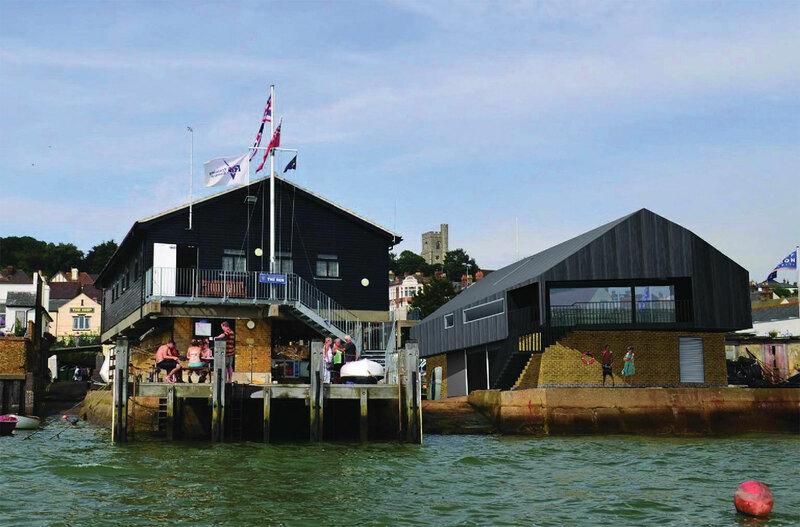 Permanency was now assured because a 125 year lease had been achieved from Southend Council for Victoria Wharf. Demolition of the old Den was however carried out by the Group at very short notice in order to fit in with the programme for the construction of the new sea wall. This was a strenuous period, and will no doubt be remembered by Neil Paxman and Doug Gamier, in that both sustained injuries during demolition. All the architectural work following the grant of planning permission obtained by the author, and based by drawings supplied by architect Bob Cheshire, was carried out by our own in-house architect Phil Blower. Phil dealt with all the detailed works, such as correspondence, specifications, preparing working drawings, also drawings for Building Regulation control approval. I would point out that all this was done without cost to the Group, and in his own time. This saved the treasurer some £4,000 in fees. Complex negotiations also ensued with the Authorities on fitting in with the work programme for the new sea wall . . . including modifications to the building design. The initial sketch scheme was dreamed up by the officers, and the group’s operational needs were built into it. The original planning permission was obtained on this basis. A side-yarn to our move to Victoria Wharf is that the then G.S.M. (a town planner) had applied for a post with Southend Council. The Chairman of the appointing committee asked him whether or not he was one of the contingent from the 3rd C.B. who had been causing mayhem over the leasing of Victoria Wharf. On receiving an affirmative reply, the Chairman opined to the effect that life would be easier for them if the young man were to be employed where an eye could be kept on him! It could be said that the 3rd C.B. were partly responsible for my getting the job.., my thanks to all! The new Den was to be a costly project of over £70,000 – certainly for a Scout group. Fortunately for us the Group Committee and latterly the Support Group had raised a lot of money, which had been wisely invested. Furthermore we were greatly assisted by the Cecil Jones Trust who met us halfway cost wise. Even then we had to borrow a further £15,000. However, all bills were paid and it was not long before the loan was paid off. The Den resulted in a very strong structure and the piles on which it rests go some 14 metres into the creek bed. Much help was given in the fitting out of the building. All in all we now have a purpose designed building, with better facilities than many yacht clubs. We are here to stay and the story of the four Dens has ended happily as in all good fairy stories should, but please let us not forget all those who made it come true. The Den was opened on the 10th of July, 1982 by Lt Cdr D Barlow, RN, the Executive Officer of our affiliated warship HMS London. I feel it must be recorded that such a tremendous achievement by a relatively small group of people to bring about the conception. construction and financing of such a super headquarters is to be admired and gratefully remembered. The contractors, Eastern Piling Ltd., stuck to their original at-cost price for the piling, in spite of the fact that many of the piles had to be driven twice their design depth up to 14 metres deep. Wemnick Buildings Ltd., who reduced their tender figure by £400. Anchor Roof Tiles, who supplied the tiles at cost. Edward Steel and Craig, who supplied all the ironmongery free of charge. Crown Paints, who supplied all the paints at half price. Milton Hall Brick Company, who supplied all the facing bricks at a reduced price. Peter Moss of L. R. Ramoss Ltd., the main contractor, who did all he could to keep costs to a minimum throughout the course of the contract. John Sime, Structional Engineer, who kept his fee to a minimum. The result being that we now have a building which was provided at what can now been seen as an extremely competitive price. Lastly I mention the work put in by Neil Paxman and Doug Gamier and their gang of helpers in laying all the concrete work around the Den. The superb Memorial Gates were provided by Norman and Betty Boughton-Smith in memory of their Patrol Leader son Roger. In 2013 we were able to purchase the land next door to The Den as well (Knapp’s Yard), giving us space to expand our operations. We’re currently fundraising for a new state-of-the-art boating centre to be build here.